We’ve been long-time fans of Louis Garneau’s apparel, so we were happy to give the Women’s Tri Course Shorts a try. And try we did. Our multi-sport editor wore these for a few long training rides earlier this year, so they certainly saw plenty of saddle time. Read on to find out how they held up. The shorts were a great length for our multi-sport editor, who is 5’9”—not too long, not too short. If you’re looking for specific measurements, the shorts’ inseam is about 9.5”/24cm. They also do include a single rear pocket, which was designed with a mesh construction so it wouldn’t hold water. We never used the pocket, opting for storage in our tri top or bike jersey instead. Although it would have definitely held a gel or two had we decided to use it. The waistband on the shorts includes an adjustable elastic drawstring, which we could see as beneficial if you’re concerned about your shorts slipping down. This was one of the few things that we actually didn’t like about the shorts. It just seemed unnecessary. Although we imagine this is probably a personal preference kind of thing, especially since we didn’t have any issues with the shorts slipping out of position on our waist. Had we needed it, we may have felt differently about the drawstring. 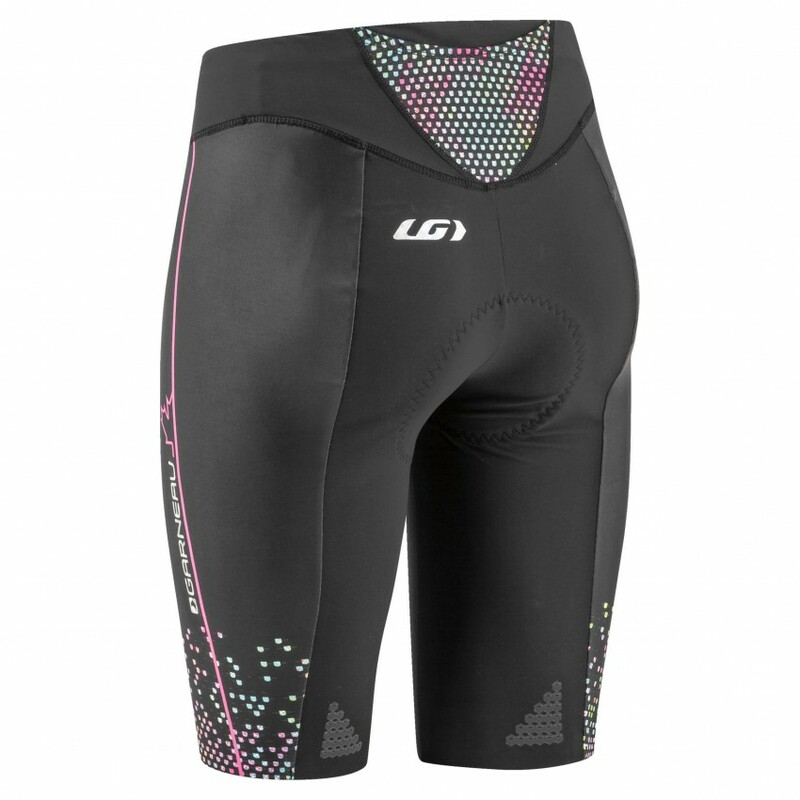 You’ll also find LG’s Tri Elite Chamois (women’s version) in the Tri Course Shorts. If you’re a long-time AG reader, you know that we typically prefer a pretty minimalist chamois. We didn’t find this one to be over intrusive at all. It was plenty supportive for hours in the saddle, while still remaining comfortable on the run. The chamois’ fabric is quick-drying, antibacterial, and allergy tested. The Tri Course Shorts are available in size XS up to XXL. Our multi-sport editor wore a small, which is her usual size in tri shorts, and they were a perfect fit. One word of caution – sometimes shorts do have a little wiggle room with those manufacturers that run large. LG isn’t one of them. A small is really a small. So pay attention to the sizing chart and take your measurements if you’re unsure. We wore the Tri Course Shorts for several training days leading up to an iron-distance race this spring, which meant our longest day in these shorts was 7 hours. While pretty much everything hurts after a 7-hour training day, we can honestly say that the Tri Course Shorts weren’t the source of our pain. We came off the bike without any chafing or friction burns, and the shorts never felt as though they were out of place. And that’s a big win in our book. Because the last thing you want to be dealing with during a day like that is pulling and tugging at your shorts. If you’re looking for a great quality tri short that looks good and will keep you comfortable even on your longest days, the Tri Course Shorts are definitely worth considering. You can pick up a pair on LG’s website for $129.